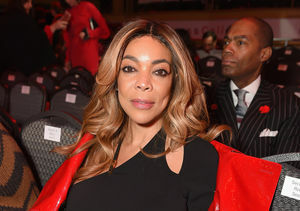 It’s over between Wendy Williams and Kevin Hunter after 21 years of marriage. Page Six reports Wendy filed for divorce on Thursday, just days after reports he fathered a child with another woman. According to TheBlast.com, Kevin was served with papers at Thursday’s taping of “The Wendy Williams Show,” where he serves as an executive producer. Insiders tell the site that Wendy decided to file after he came clean to her about his actions weeks ago. It has been a tough few months for Wendy, who recently took two months off from her talk show. At first, she told fans she was recovering from a fractured shoulder and suffering from Grave’s disease. Later, she revealed she had moved into a sober-living house. Wendy and Kevin wed in 1997 and have an 18-year-old son named Kevin Jr.
Williams revealed in her 2004 memoir “Wendy’s Got Heat” that Kevin cheated on her after Kevin was born.